This is a quick primer on derive mode procedural macros. Quick summary of the problem we’re trying to solve. And likewise for nng_listener and nng_pipe. We started to replicate this mass of code for nng_listener, nng_dialer, et al. But let’s be honest, copy-pasting code is one of the most dubious code smells. #[proc_macro_derive] defines our #[derive(..)] macro. Within that, attributes(..) defines our “derive mode helper attributes” (i.e. #[prefix] and #[nng_member]). The input to this function is the stream of tokens of whatever code the attribute is attached to. The output is the new code we want to generate. The quote macro does the work of taking the source code we provide, substituting in values prefixed with #, and then generating a TokenStream to return from our macro. It generated "nng_getopt_bool"(...) when we need nng_getopt_bool(...). Give it a String and it will give you one right back! 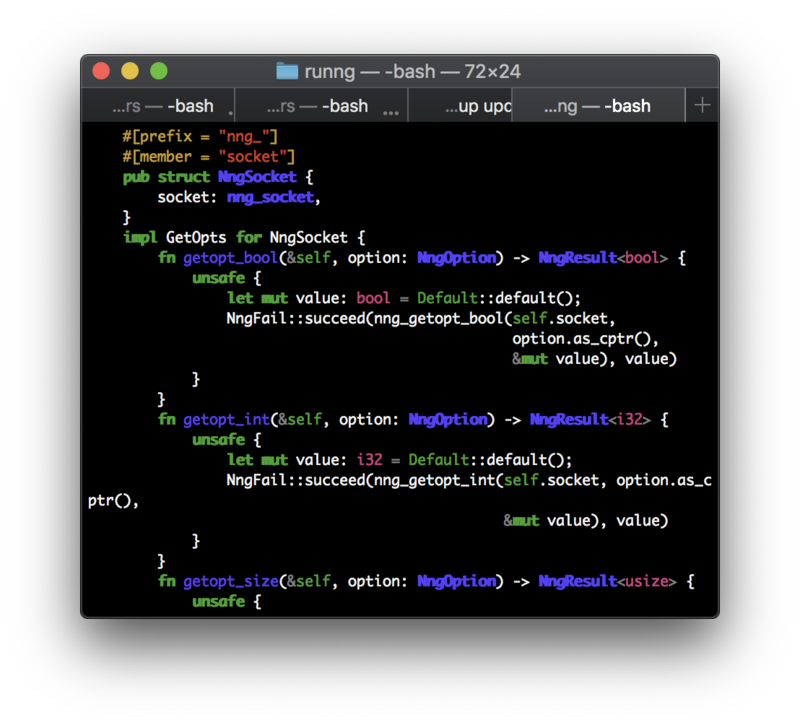 cargo expand dumps the output for the entire module which might be more than you want. It can be limited to a single test with cargo expand --test name_of_the_test and there’s some other useful options. // Iterate over the fields: `x`, `y`, .. This is a pretty basic implementation; there’s no error handling, doesn’t support #[nng_member] on a nested field, etc. But, since this macro is just used internally to our crate for educational purposes it’s probably ok for now. All this is pretty similar to a common use of discriminated unions in F# (and probably every other language with functional tendencies). Supporting more features and robust handling will probably turn into an exercise in recursive matching. syn- syn crate documentation. This is needed to write derive_nng_opts() when working with the AST. (Optional) Little Book of Rust Macros- covers macro_rules! The last item, the LBRM, was actually one of the first things I read but probably the worst place to start. If nothing else, read the “Macros in the AST” section. It’s a good overview of macros in Rust and was helpful in coercing my mental model (string substitution) to reality (intermediary form used by compiler). We’ve barely scratched the surface here. For one thing my slavish use of syn::Ident::new(.., syn::export::Span::call_site()) warrants investigation- it’s merely the first thing that worked. The syn crate has a lot of stuff. I’d like to revisit the Little Book of Rust Macros and take a shot at macro_rules!.